As Number 10 refuses to say how many child refugees Britain will accept, the Prime Minister's spokesman insists his offer is genuine. SNP member Pete Wishart has claimed English MPs were "driving Scotland out" by banning Scottish MPs from voting on English-only matters. There are certainly more significant issues at stake when China's President Xi Jinping visits Britain this week. With one MP storming out of the party's weekly meet, is Labour heading for trouble already? 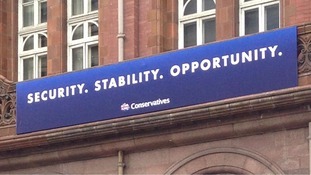 "Security, stability, opportunity" is the catchphrase of this year's Tory conference, which begins in Manchester on Sunday. Jeremy Corbyn, centre, arrives with deputy leader Tom Watson, left. Newly-elected Labour leader Jeremy Corbyn has arrived for his first official engagement at the Battle of Britain memorial service at St Paul's Cathedral. He was wearing a tie and was accompanied by his deputy Tom Watson. There had been suggestions Mr Corbyn wasn't keen to attend but it seems such concerns were unfounded. In a statement released to mark the ceremony, Mr Corbyn praised those who had helped Britain and the allies defeat the Nazis. Like that whole generation, they showed tremendous courage and determination to defeat fascism. The heroism of the Royal Air Force in the Battle of Britain is something to which we all owe an enormous debt of gratitude. The loss of life - both civilian and military - should be commemorated so that we both honour their lives and do all that we can to ensure future generations are spared the horrors of war. What will the so-called 'security budget' mean for jobs? The headline-grabber was financial security and that "living wage" - but how will the cuts affect working families? Whether or not Ed Miliband makes it into Downing Street, he did today at least look the part of a Prime Minister in waiting. Last night there wasn't one particular knockout blow but the political landscape in Britain does seem to be shifting.